Designed to fit today’s big 3-person watercraft, this new trailer is loaded with special features! Convenient step-on access to your machines. Durable, impact resistant fenders will not rust, to keep your trailer looking great for years. These “v” crossmembers allow your machines to ride as low as possible. This lower center of gravity provides safer towing, better gas mileage and easier loading at the ramp. These trailers have been designed around the largest PWCs on the market to ensure a perfect fit. Better fit means better performance on the road and at the ramp. This sturdy crank winch features an adjustable bow stop and durable nylon strap that will not tangle or fray. Choose the 10”, 175 x 13” or 185 x 13” to get the desired carrying capacity. The fender and chassis are designed to fit all three. Aggressive chrome design to accent your watercraft. Carpeted bunk supports conform to the hull for the perfect fit. Optional Walkboard provides easy access to your watercraft. ShoreLand’r makes the journey as painless as possible with features like smooth rolling factory-balanced wheels for better performance and less vibration. In addition to that, the frame is designed to keep the PWC riding low for less wind resistance and better gas mileage out on the highway. Different users have different needs and that’s why ShoreLand’r offers a complete line of Genuine ShoreLand’r Accessories. Everything from spare tires to our popular walk boards and ShoreLock’r storage box. Whatever it takes to make your trailer fit your lifestyle. ShoreLand’r has developed a unique powder-coating process that creates a deep luster, automotive-style finish. This Superior Quality Finish provides long-term protection against fading and chipping so your trailer looks better, longer and holds its value. One of the most important duties of a trailer is to protect your PWC when it’s out of its element. 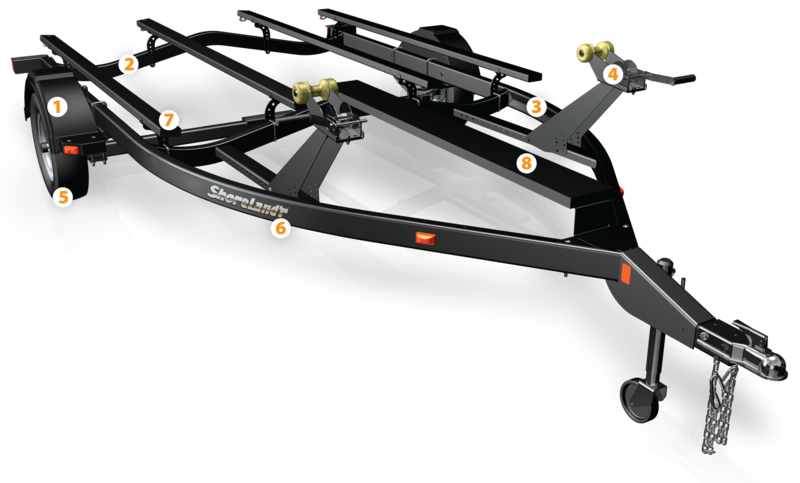 ShoreLand’r does it with welded Uni-frame construction that provides maximum strength and less flex to ensure longer trailer life. Custom Molded Fenders protect your watercraft from road debris.